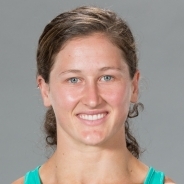 Queensland native Tia-Clair Toomey rocked the CrossFit world after taking second at the 2015 Reebok CrossFit Games as a rookie—after only two years of CrossFit—and earning the distinction of Rookie of the Year. She proved it was no fluke with another second-place finish in 2016. Though her background is in track and field, she became Australia’s top-ranked female weightlifter in 2016, qualifying for the Summer Olympics in Rio de Janeiro, Brazil, where she snatched 82 kg (180.7 lb.) and clean-and-jerked 107 kg (235.8 lb.) for 14th place in the 58-kg category. Owner of CrossFit Gladstone in Queensland, she is the only CrossFit athlete to have competed in the CrossFit Games and the Olympics in the same year.